Buckwheat peers out of the window of his "ride" to his Chicago base, courtesy of pilot Jamie Fallon. Last Friday, I'm walking into Greater Chicago on U.S. 30, from Indiana, and the plan was to be at this airport at 4:30 p.m. where former TEMSCO pilot Jamie Fallon was doing some work. Talk about perfect timing, I'm walking and I see this great big ugly helicopter over by an airport. I had assumed he'd be in an A-Star or Jet Ranger like they use in Skagway. My cell phone starts to ring, and I tell him I'm at an airport and looking at the ugliest helicopter I've ever seen. And it's him! 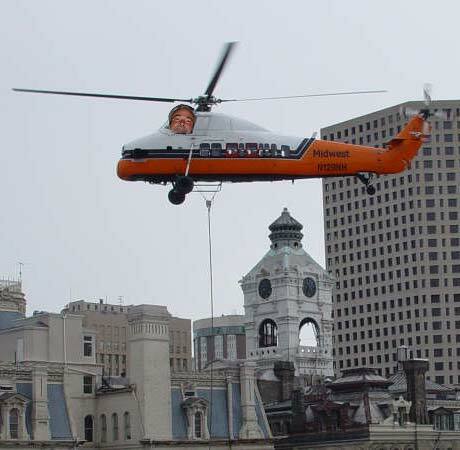 Man, that thing was hard to get into, but I even got to fly it. He let me take the controls a couple times but I handed it back to him. Made me nervous. Jamie has just been incredible the past few days. He modified his whole schedule to fit mine, and I spent the weekend walking through Chicago. We said our goodbyes this morning. Now I'm north of Chi-town in Highwood and they're playing classical music in McDonald's. Pretty high class neighborhood. Walked by Loyola and then through the Northwestern University campus today in Evanston. Lots of pretty girls. Walked by some really big homes in North Evanston too, and now I'm in this classy McDonald's waiting for a ride to a free place to stay for the night. Should be in Wisconsin on Friday and through the Madison area by Sunday night.